If you thought that Anchor Bay only planned on yearly re-releases of Halloween and Evil Dead think again. From the looks of it they'll also be rolling out a new line of home videos under the moniker "Cult Fiction" in March. The new discs, while sporting some sweet retro cover art, look to be pretty bare bones and contain none of the special features included on the original releases of the titles. But like I said, I'm loving the artwork. 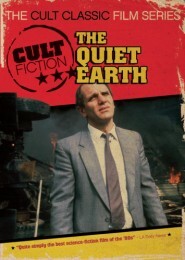 Some titles to be included in the series are; everyone's favorite cannibalistic sewer dwellers film C.H.U.D., Class of 1984, The Man Who Fell to Earth, The Wicker Man, Long Good Friday, and, our own personal favorite, The Quiet Earth.